Everyone knows Craigslist as “the” online classified ads site. It’s been around forever. But now there are other options so we’re not stuck with the limitations of Craigslist anymore. The site I really like is called OfferUp. You can use OfferUp from your computer (just go to offerup.com) but it’s really designed to be used from your phone. That’s what makes it so incredibly easy and fast to use, whenever you want to sell something. Choose a picture to display (you can use up to 5 pictures). You can either take a picture with your phone right then and use it, or select from pictures that are already on your phone. – OfferUp has a much more modern user interface. If you look at the Craigslist website, you’ll see that it is using the same boring format that was there when it was originally created. – When you post on OfferUp, the item for sale is immediately live. With Craigslist, it’s usually at least 15 minutes before it shows up in searches. And sometimes when Craigslist “ghosts” your ad, it NEVER shows up. And they don’t contact you to tell you that. – OfferUp has user ratings. This is one of my pet peeves about Craigslist – when I set a time to meet someone who is either selling something, or buying something from me, at least half the time the other person just doesn’t show up. Even people that email and say “I’m on my way now” somehow never make it to the meeting spot and don’t call or email to say they won’t be there. With OfferUp, if someone does that, you can include that information in the rating/review so that other people will know about it before they decide to deal with this person. When someone knows their reputation is at stake, they are probably going to act more responsibly. Craigslist has no user rating system and both parties can remain anonymous if they want to). – OfferUp has it’s own messaging system, built right into the app. This is very convenient. Craigslist still relies on its antiquated “anonymous email” process. – With Craigslist you cannot repost or “bump” an item for sale more than once every 48 hours. OfferUp gives you the option to do this more often (at a cost of $1.99). This just means your item goes back to the top of the list, so that users who are browsing are more likely to see it. 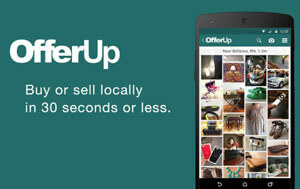 – OfferUp gives you a real-time display of how many people have viewed your item’s listing. This is nice to know. With Craigslist, you can add some code and display a counter in the listing itself I think (or at least you used to be able to) but it’s not a part of Craigslist’s process and it’s definitely not as easy. I think the only advantage for Craigslist is the fact that it has been around longer, so more people are aware of it. However, OfferUp has become a dominate player in this game so when you list something, it will be seen by a lot of people. I recently did list a mattress on OfferUp, like I mentioned in the example above. This was late one afternoon. It ended up getting 82 views, and someone came and purchased it the next morning. Can’t complain about that. There is another popular app that works similarly to OfferUp. It’s called LetGo. Pretty much the same process, but I just like OfferUp better. If you are really serious about selling something, probably the best strategy would be to OfferUp, LetGo, AND Craigslist. They’re all free, and the more eyeballs you can put on your item, the better, right? Do you use an online selling service such as these, that I didn’t mention? Let me know in the comments. My dryer belt broke Saturday night. Thanks to offerup.com, I was able to find used dryers in my price range within 5 minutes of searching. I hope to purchase a replacement TODAY. Thanks. Good point Mike. I didn’t even talk about the advantages of buying on OfferUp. Glad it’s working for you!